This stunning gated residence with Ocean Views sits on a bright private 1/2-acre property on Lower Caulfeild’s popular Clovelly Walk. Exceptional quality and design are evident throughout the entire home and includes reclaimed wide plank hardwood floors, hand crafted custom millwork and exposed wood ceiling beams. Extensive stonework includes indigenous limestone, rhyolite and custom fireplaces. 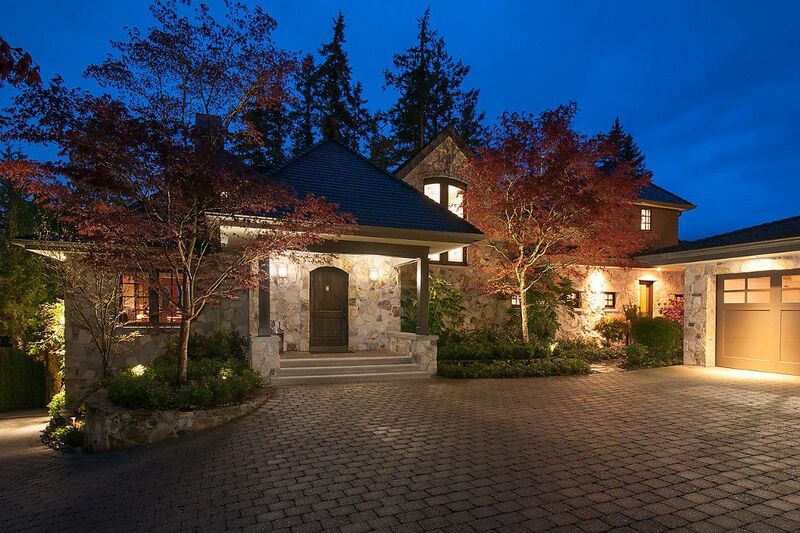 Designed by renowned architect Gordon Hlynsky and built by highly regarded Bradner Homes, this custom European style manor offers approximately 6288 sq. feet of remarkable architecture and high quality construction. The attention to detail and craftsmanship of this three level home shows it was built to the highest of standards. The well planned use of the natural landscape leaves it as stunning on the outside as it is on the inside. On the main level a sensational entrance foyer leads you into a spacious entertainment sized great room. From the formal dining area in this room your guests will enjoy the views from the wall to wall sliding doors that open up to the exterior resort style entertainment area. Here you will find a covered heated terrace running the length of the house. The full size sliding doors bring the inside area out and a gourmet BBQ beside a separate dining and sitting area on the terrace makes summer gatherings an entertainers dream. Beyond the great room and formal dining area you have a warm cozy dining and family room beside a stunning gourmet kitchen. This area is entered by a walk through pantry with custom cabinetry that carries into the kitchen. Top of the line commercial quality appliances are surrounded by custom stonework that needs to be seen to be appreciated. A large entertainment sized marble island with breakfast bar tops this area off. The upper level hosts four large bedrooms including a very spacious master. The master bedroom includes his and her walk-in dressing rooms with an elegant ensuite. All upper level rooms share the gorgeous garden and ocean views. From the terrace and upper rooms you overlook your extra deep lap pool, hot tub and pool side lounging area with fire pit. The extensive custom landscaping around all of this provides a park like setting topped off with ocean views. The poolside lower level is your family media recreation room with wet bar, temperature controlled wine storage, exercise gym, steam showers, change room, guest room and large storage and mechanical rooms. Just off the main entrance foyer you will also find a luxurious private study that looks out to the ocean views perfect for those that desire a home office. The upper level parking courtyard leads to your 3 car radiant heated garage. Other features of this home include: geothermal technology, radiant heating, air-conditioning, intelligent Logic 7 interior and exterior lighting systems, high-end stereo in all interior and exterior areas with separate controls, security systems, in ground sprinklers, dog bath and large mud room.